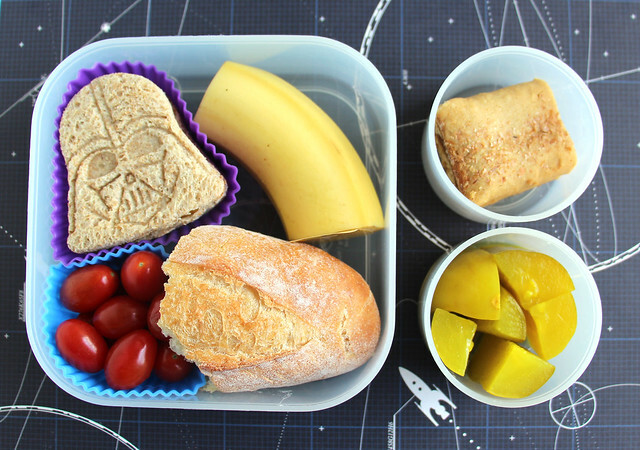 I was still in a Star Wars-y mood on Monday after Star Wars Day on Sunday, so I packed Augie this vaguely Star Wars-ish lunch in the Yubo : a Darth Vadar peanut butter and jelly sandwich, half a banana, grape tomatoes, a chunk of baguette, a raspberry cereal bar and dill pickles. That kid loves dill pickles! 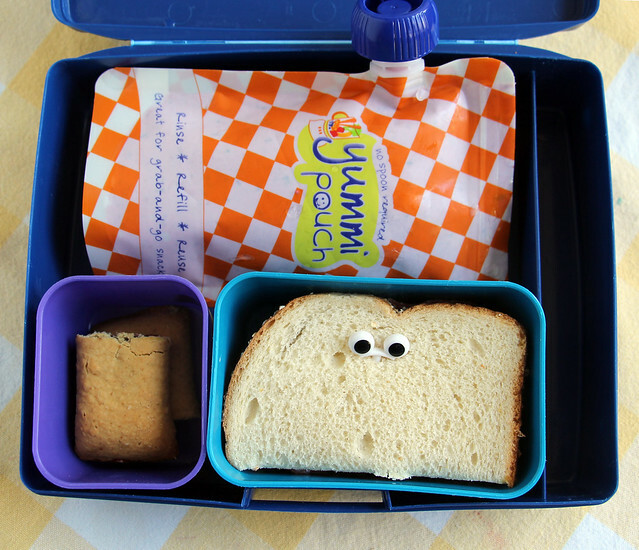 Wyatt started his week of lunches off with some leftover lasagne packed into a thermos along with a piece of garlic bread and a banana. I was in a huge rush to get him out the door, so I didn’t get a photo. 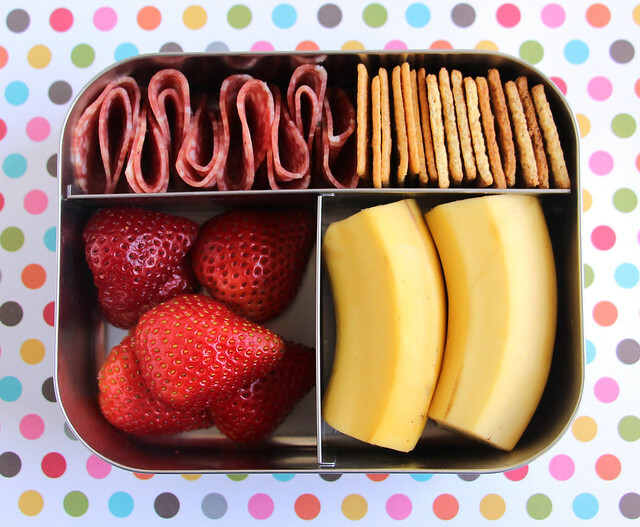 I kept Wyatt’s lunch super simple on Tueday: salami, crackers, strawberries and bananas packed into the LunchBots Trio. And despite getting his approval on every item before putting it in his lunch box, he still only ate the salami. 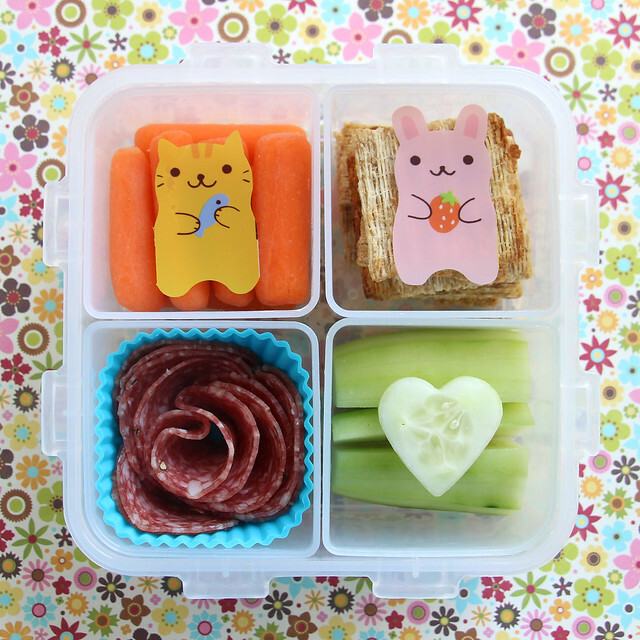 Tuesday morning was beautiful and springy so I was inspired to make this flowery lunch for Augie. I have to admit that I was really pushing it by making this lunch. 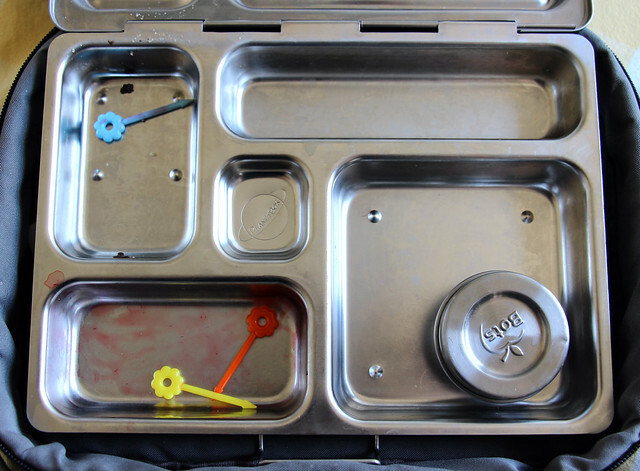 Despite all my efforts to raise open-minded, feminist boys who can handle a few flowers in their bento boxes they are allll about the gender norms right now and I knew there was a possibility that he would refuse to eat it on principle. 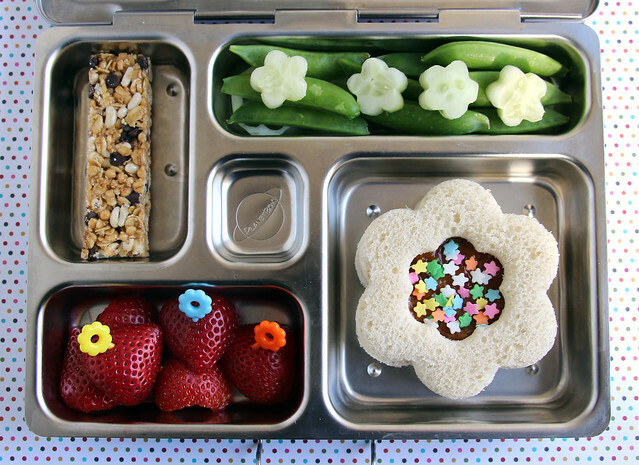 I packed this meal in the PlanetBox Rover: a chocolate chip granola bar, sugar snap peas, cucumbers cut with a flower cutter (the scraps were under the peas), a flower sandwich and strawberries with flower picks. I made the sandwich by cutting two large flower shapes from bread with this cutter set . Then I cut another flower shape from one of the slices of bread using a smaller cutter from the same set. I filled it with peanut butter and jelly, then added some flower sprinkles in the hole on top. And it turns out I needn’t have worried about him eating his lunch because it was completely empty when we got home! Wyatt has been asking me for smoothies a lot lately, so I made a big batch for breakfast on Wednesday morning and then filled our Yummi Pouches with the leftovers for the boys lunches. This one was mostly made of frozen berries, but I also added some Greek yogurt and milk to give it a little creaminess. 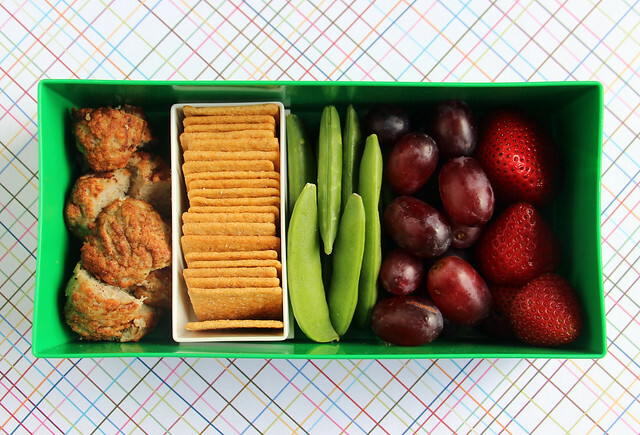 I tucked the pouch into a Laptop Lunches box, along with a cereal bar and a salami and pesto sandwich. The sandwich looked so plain and boring in the box so at the last minute I poked an eye pick into it to jazz it up a little. I don’t think it helped at all! 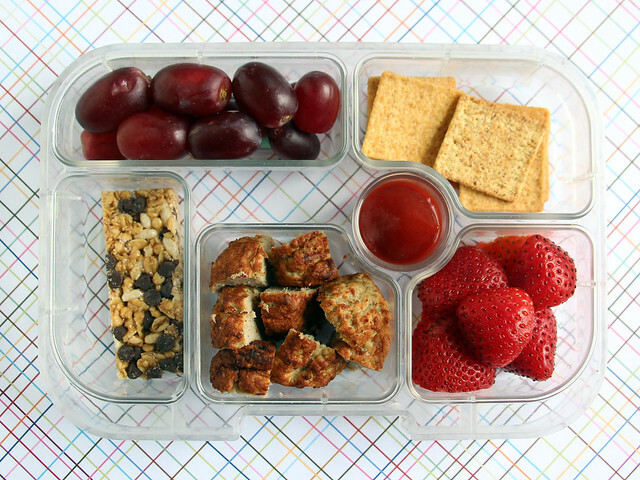 Here is the Yumbox lunch I packed for Wyatt: grapes, Triscuits, strawberries, turkey meatballs, and a nut-free granola bar. Augie had the exact same lunch, but I swapped in sugar snap peas for the granola. 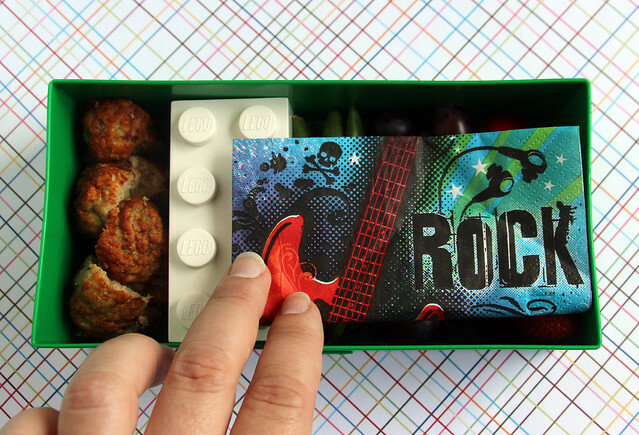 This was packed in our Lego bento box and the crackers were in a smaller Lego box that fits perfectly inside it. This Lego box is really tall and I’ve found the lunches I pack in it can get mixed together because there’s often a lot of space at the top after I’m done packing it. Here’s a quick tip to prevent that that I got from Kendra at Biting the Hand That Feeds You: fold up a napkin and set that on top of the food before you put the lid on the box. The napkin expands a bit and holds the food in place. 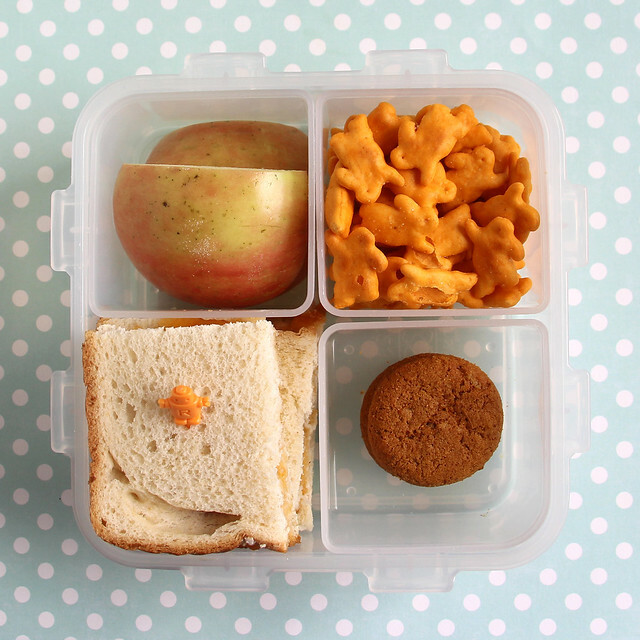 Friday I used the Lock & Lock bento box for Wyatt’s lunch: apple chunks, cheddar bunnies, a few ginger snaps and a jelly sandwich with a robot pick stuck in it. Augie stayed home from school with a tummy ache, so it was plain rice and bananas for him. Have a good week! We are heading into a heat wave here in the SF Bay area and I’m kind of looking forward to it!